We hope you are enjoying using Quick Insights on your dashboards, and we are happy to announce that Quick Insights scoped to a single tile just got a whole lot smarter. This is a great feature for getting more targeted and scoped insights for your data. Our first update a month ago included insights generated with an understanding of simple filters. We are now releasing an update that also understands complex filters. What does this mean for your experience? It means that you can narrow down the auto-generated insights by putting more complex filters on the visual you’re starting from, making the insights work better for the specific measures you are interested in. Or, if you already have visuals with complex filters, you will get more targeted and useful auto-generated insights. 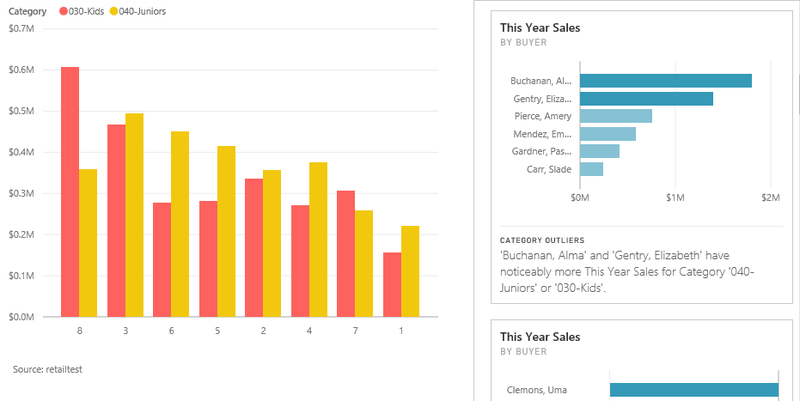 As an example, image you are looking at this year’s sales data, and you want to better understand what is going on in two specific product categories that seem to be missing their target: kids and juniors. To do this, you filter your sales data further to include only these two products. This kind of filter is an example of a complex filter, and you likely already have examples of this on your own dashboards. From your dashboard, you can go to Focus mode of this visual to apply these filters and click Get Insights to discover more interesting things filtered just to these product categories. In other words, all the auto-generated visuals will only include one or both of these products. As well as the store that has the least sales for these two product categories. Both auto-generated visuals are useful for identifying the problem. Now you could contact these stores to learn what they are doing differently. You can also filter the visuals further to these stores and maybe discover further leads that will help you pinpoint to the right problem/improvement area. Filters with less than, less than or equal, greater than, etc. Filters for dates with on or after, on or before, etc. Tip: Did you know you can filter further on the visuals in Focus mode? Try clicking on a bar, line, or selecting an item from legend. When you run insights after visual filtering, you will discover things scoped to the filtered item.